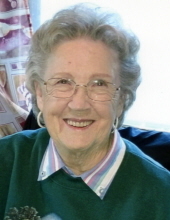 Elaine Maxine Gregg, age 88, of Fremont, Nebraska, passed away Monday, April 1, 2019, at her residence. Elaine was born in Bancroft, Nebraska, on April 2, 1930, to Adolph and Gertrude Brummond. She has worked at Hinky Dinky, Goodwill, and Walmart. Elaine truly loved spending time with her family, as well as gardening, playing cards, auctions, and especially her dogs Pennie and Scotty. Survived by her daughters Sandra Husar of Oakland, NE, Linda Morton of Lincoln, NE; Son Warren E. (Donna Bye) Gregg of Sioux City, IA; Grandchildren Jackie Marshall of Rantoul, IL, Marsha (Jared) Sampson of Fremont, NE, Michelle (Jim) Dutton of Lincoln, NE, Mark (Lisa) Morton of Genoa, NE, Bryan (Misty) Morton of Lincoln, NE, Warren M. (Katie Weber) Gregg of Sioux City, IA, Misty (Scott) Quinn of Sioux City, IA, Luke (Jessica) Nixa of Akron, IA, and Erica Chandler of Fayetteville, AR; Sister Lenora (Brian) Simmons of Wasilla, AK; Sisters-in-law Marge Brummond of Litchfield, MN, Irene Brummond of Omaha, NE, and Judy Brummond of Omaha. Preceded in death by her husband Warren L. Gregg; her infant son Dennis Gregg; grandson Joel Gregg; Sons-in-law John Husar and Conrad Morton. Memorials have been established to the FurEver Home for Pets (236 W. 6th St Fremont, Nebraska). Visitation: 5:00 – 8:00 PM Sunday, April 7, 2019, at Dugan Funeral Chapel. Funeral Services: 11:00 AM Monday, April 8, 2019, at Dugan Funeral Chapel. Pastor Mark Eldal will be officiating. To send flowers or a remembrance gift to the family of Elaine Maxine Gregg, please visit our Tribute Store. "Email Address" would like to share the life celebration of Elaine Maxine Gregg. Click on the "link" to go to share a favorite memory or leave a condolence message for the family.